after-dinner treat - moist, sweet and tart and simply delicious! Just when you think it's over...it's not! There was yet another nice sized zucchini hiding under the leaves. We thought we'd turn this one into something sweet for a dessert treat. Giving it a zesty lemon flavor, then adding a lemon glaze was just the right touch! This recipe is moist and delicious - perfect for a light after-dinner treat. Spray or grease and flour a 9x5 inch baking pan. In a large bowl combine all dry ingredients and mix well. Add in the lemon juice, lemon zest, oil, vanilla and milk and mix thoroughly once again. Finally add in the zucchini and stir until well blended but not over mixed. Pour batter into pan and bake for 45 minutes or until toothpick inserted in center comes out clean. Once the bread is finished allow it to cool. While it is cooling mix the glaze by adding 1 cup powdered sugar to a small bowl. Stir in the juice from 1 lemon and mix until smooth. 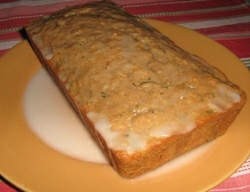 Spoon glaze over top of bread. Serve when ready.